The House Armed Services Committee is nuts over the Mine Resistance Ambush Protected Vehicle, or MRAP, which has a v-shaped hull that makes it resistant to bombs. In two separate markups of the fiscal year 2008 defense authorization bill, the House Armed Services air land and seapower and expeditionary forces subcommittees have increased MRAP procurement funding by $4.1 billion. The vehicles cost about $1 million per copy. 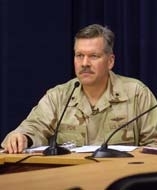 Just got off of a bloggers' round table conference call with Colonel Mark Martins, Staff Judge Advocate, Multinational Force—Iraq. The point that Martin wanted to emphasize today was how the Rule of Law took a step forward in Baghdad yesterday. For the first time, criminal proceedings were brought by Iraqis against alleged Iraqi criminals -- one an alleged Sunni Al Qaeda operative, the other a Shiia national police officer alleged to have abused Sunnis in his charge. One of the the main things that made this possible is a refurbished facility the Iraqi government is calling The Rule of Law Complex, a secure location where Iraqi police, courts, and prisons can work together in comparative safety. I had the opportunity to participate yesterday morning in a bloggers' round table conference call with Rear Admiral Mark Fox, Communications Division Chief, Strategic Effects, MNF-I. I asked him what technology he had that was helping him do his job. Fox was quick to promote the work his unit is doing getting the word out using Web 2.0 rage YouTube. But, seriously, Fox said one of the problems they were trying to solve with their YouTube site was video rolling off of their other news pages after only one news cycle. There were certain stories they wanted to highlight. They want to allow middle America access to interesting video from Iraq, like Predator videos and video of night vision technology at work, Fox said. Oil, oil everywhere, and not a drop for troops on the brink. How is it that in Iraq -– a country with one of the richest fuel reserves in the world -– the country’s armed and security forces find themselves literally running out of gas? According to U.S. Army Col. Stephen M. Twitty, commander of the 4th Brigade, 1st Cavalry Division, it’s simply a question of training. The Iraqis in charge of procuring and acquiring the fuel don’t know how to do their jobs yet. “It’s a coupon system,” he said during a March 22 Pentagon briefing via satellite from Iraq. What the Iraqis thought the coupons were for is a bit unclear. What is clear, though, is that this kind of situation can get a commander fuming. As Twitty explained, for one military operation he was expecting a brigade’s worth of power. But, because the gas gauges showed “E,” he could only get a little more than a battalion. The right kind of training, he said, is being accelerated. Every other week or so I read a story about the war in Iraq in which an American military officer or soldier, or an Iraqi police officer says something along the lines of, "They keep inventing new ways to kill us." It is ironic for a news site dedicated to cutting edge, state-of-the art, whiz-bang military technology that the enemies of the United States in Iraq are wreaking havoc with the lowest tech equipment available. Conventional explosives rigged up with stuff you could find in your garage. 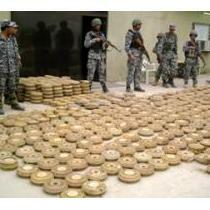 And then they're driving these homemade bombs right past the security checkpoints built to stop them. How? Apparently, by doing little more than covering their explosives with tennis shoes and bricks. about Iraqi Special Operations Forces (ISOF)? If you're like me and the other reporters on the phone yesterday morning with Capt. Michael Zamesnik, USN, MNSTC-I, not very much. Still we didn't get to hear much beyond "like other special forces units, they're kicking a--." We might get to hear more later. We might not. But I thought it would be interesting to do a little research to see what the Internet knows about ISOF. But very very important -- and absolutely vital to sustaining an effective fighting force, especially one you expect to deploy away from its home base. And as the Iraqi Army becomes increasingly deployable (just within Iraq's borders, of course), its creaky, corrupt and anemic logistics system must catch up. It's Army Brigadier General Terry Wolff's job to help. "At the top we're trying to get them to stand up a support command," says Wolff, commander of the Coalition Military Assistance Training Team based in Baghdad. 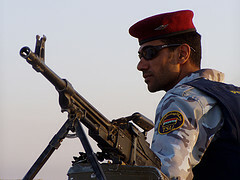 That, he says, is a first step to buidling a supply and maintenance organization that can see to the needs of Iraq's ten divisions and half-dozen independent brigades; several brigades have deployed to Baghdad from their regular stomping grounds in the north or south in order to work alongside the U.S. Army in suppressing insurgent activity in the city. There is a simultaneous effort to improve Iraq's national depot at Taji -- staffed by around 1,000 logisticians -- by adding maintenance facilities, which should be in high demand as Iraq brings on increasingly complex weapons and vehicles including I-LAV blastproof trucks. The other missing piece, once the command and the depot are up and running at full capacity, is motor transport. "Nine divisions have motor transport regiments for the distribution of supplies," Wolff says. In some cases these 700-man regiments and their several dozen trucks connect directly to the national depot; in other cases they draw material from five regional depots that are like spokes to Taji's hub. But to get supplies from the port of Umm Qasr to the depot, Iraq is still relying on Western contractors. And since Iraq has just three dilapidated C-130Es to its name, the U.S. still conducts the vast majority of aerial supply runs. What's more, at all levels, Iraqi logisticians continue to lean on U.S. and coalition advisors -- and will for the foreseeable future. 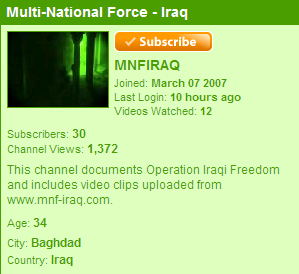 Speaking of video, Multi-National Force - Iraq is also posting and pushing video. DefenseLink today reports that, not only does MNF-Iraq have video on its website, it's putting up video on its own YouTube channel as well. 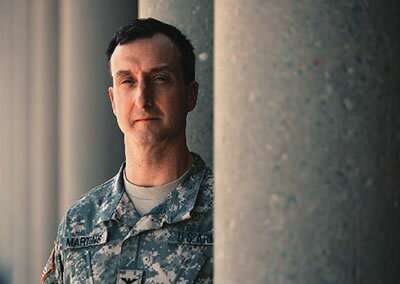 Since the multi-national force began the initiative on March 7, six videos have been posted, resulting in thousands of viewings. I was not thwarted! I am finally listening to General Petraeus' briefing from Friday. 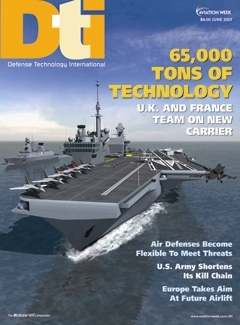 DoD is obviously trying to get their version of Iraq and Afghanistan out. Are they succeeding? What do you think? These days it seems like everybody and everything in the U.S. military is trying to find and destroy Improvised Explosive Devices in Iraq. Cold War weapons such as Prowler jammer planes have joined new blast-proof vehicles and a gazillion kinds of robots in the counter-IED fight. One of the latest systems? A robotic chopper equipped with the latest sensors capable of seeing underground to spot buried roadside bombs. The Army is buying the $9-million Northrop Grumman MQ-8B Fire Scout drones to outfit Future Combat Systems brigades beginning around 2010. The Fire Scouts will come equipped with an advanced infrared sensor built by DRS, based in New Jersey, and integrated by Northrop Grumman. 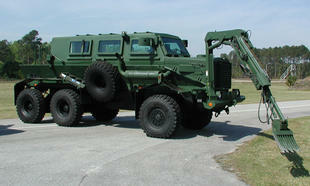 The Army calls it Advanced Surveillance, Target Acquisition and Minefield Detection System, or ASTAMIDS. DRS should deliver the first two ASTAMIDS this summer. But the drones they're supposed to be fitted to are sitting in a warehouse because their control systems, based on the troubled Jitters radio, won't be ready for another three years. That's Army bureaucracy for you.